The Intrepid 400 Cuddy is a high-quality performance cruiser with the advanced design and engineering attributes common to all modern Intrepid yachts. 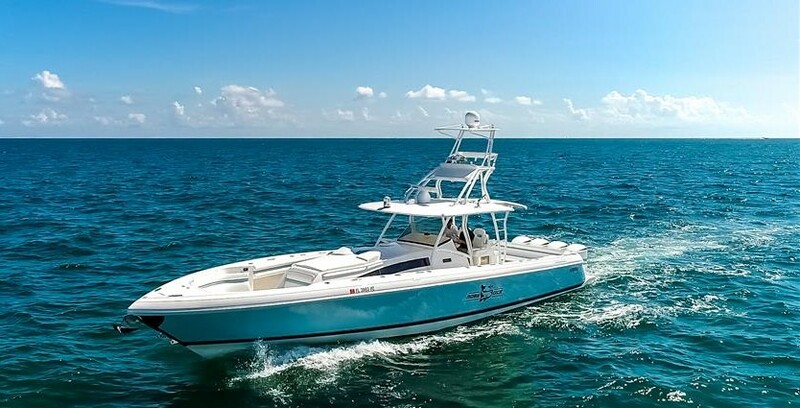 A semicustom boat with an extensive list of factory options, the 400 Cuddy combines many of the best features of a center console with those of an express cruiser. Built on a single-step deep-V hull with a fine entry and slender 11'1" beam, the 400 is fully cored and vacuum-bagged to create a strong-but-light laminate. The deck layout is as versatile as it gets with a center console boat—a pop-up console houses the electronics; modular fixtures allow the cockpit to be configured with an array of seating arrangements, and numerous livewell and wet bar options ensure that no two Intrepid 400s are alike.